A welcome email is the first impression your new subscriber receives in their inbox. This is one of the most important emails you should send to all new subscribers. You are making a first impression on behalf of your brand. It rolls out the tones of your future communication and motivates your new subscribers to engage with your business. To ensure that you’re making the best impression, we have gathered ideas to make your welcome emails stand out from brands big and small. 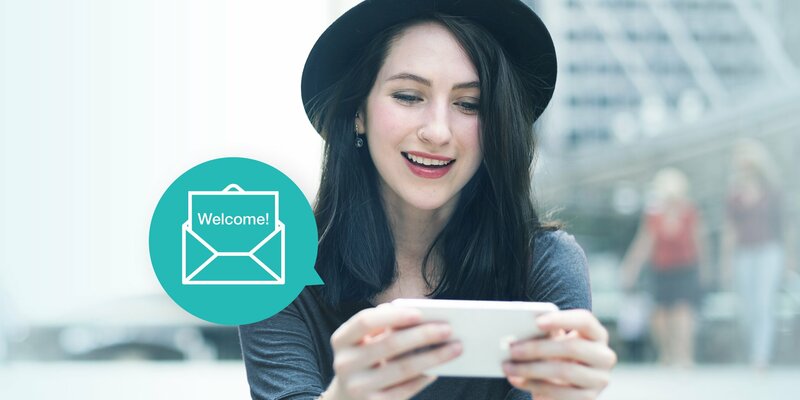 Here are great ideas and tips to make your perfect welcome emails that would capture your subscriber's attention. This is a warm presentation of your company’s personality. In the example above, David’s Bridal send a great introduction message by thanking new subscribers to take part in their wedding day. You can write either a simple message such as "Welcome to our Newsletter" or a casual message as ‘’Hey guys!! Welcome to our company it’s cool to meet you’’ or you can be formal as well like David’s Bridal. In general, there are no rules to welcome a new subscriber just it has to represent your company’s image. This is a good way to support the subscriber’s decision to sign up for your email list by offering a quick perk list that reminds the great idea to join your list. Wag.com explains clearly the benefits by joining their email list with a perk list written with bullet points. You’ll kick off with a good start with your new subscribers and your business by offering them discounts and early bird promotions. It will motivate them more to make their first online transaction. Just like Overstock, welcoming the new subscribers with 10% discount. Incentivizing your subscribers establishes a good rapport. J.CREW offers free shipping for the first purchase with a call to action to shop on their website. The email above is efficient not only because it looks neat with a great promotional offer, but with a clear call to action. You should design a call to action color that complements your email template. In addition, your Email Call to Action should be written with urgent words like ‘’ Shop now’’ from Bonobos. A great welcome email must work well on all mobile devices not just to look good. Almost 80% of smartphone owners read their emails on mobile devices. When you use Taximail, you will have access to preview your email campaign on any mobile devices. You will have the confidence that your email is mobile responsive no matter what device they are viewed. Your new subscribers will be curious about your business, so your Email Marketing and Newsletters should include a link to your Social Media. In the example below, we can see clearly the social media buttons in the bottom right corner linking their Facebook, Twitter, Youtube, and Pinterest. It’s always a great idea to let your subscribers other ways to keep in touch with you and your business. These examples will help you create better-crafted emails. Keep in mind – if you will give them the “WOW” factor in the very beginning, they will remember you. Your next email will be much anticipated. You will have a high open rate and don’t forget a relevant content goes with it.